Power Punch Smoothie | Kitchen Mischief! « The. Best. Cookies. EVER. Ground flax seed – I mentioned this in my granola post. This little seed, when ground, has the same Omega-3 fatty acids as a salmon filet. And I bet you flax seed taste better in a berry smoothie than a salmon filet. Found the box of ground flax seed at Publix. 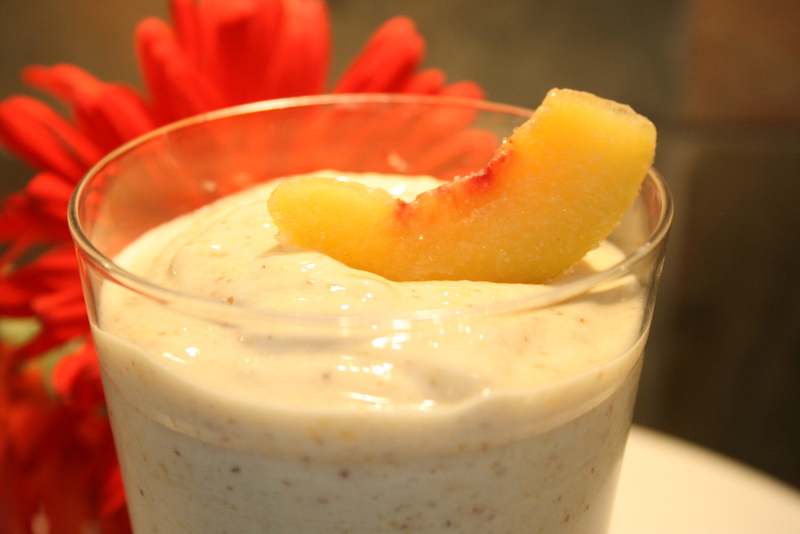 Yogurt – This adds a little flavor (I use fat-free, light vanilla) and also adds protein. We all need some protein after a workout to rebuild muscle. Pomagranet Juice – this antioxidant rich juice will block those free-radicals. No, I’m not speaking of protesting hippies but rather those cancer causing agents that take a toll on your body. Blue Agave Sweetener – Blue Agave, as you know, is the plant that makes tequilla; but in this case the sugars are made into a syrup. It is 3 times sweeter than sugar but it doesn’t give you that sugar crash. Cool, huh? I found the bottle in the picture at Costco but I saw it at Publix and Whole Foods. In a blender (mine was ghetto so I didn’t take a picture of it), add the ingredients in the order listed above. Start your blender on the lowest cycle and then work your way up until blended smooth. A little too thick for you? Add a little more pomegranate juice or orange juice. Josh is not a berry person. He doesn’t like those little seeds in his dentures. So this one is for him. 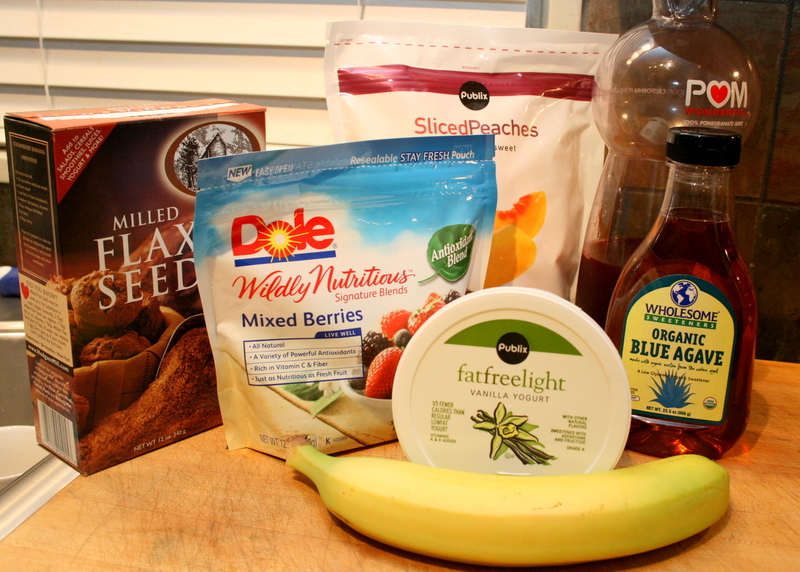 In a blender , add the ingredients in the order listed above. 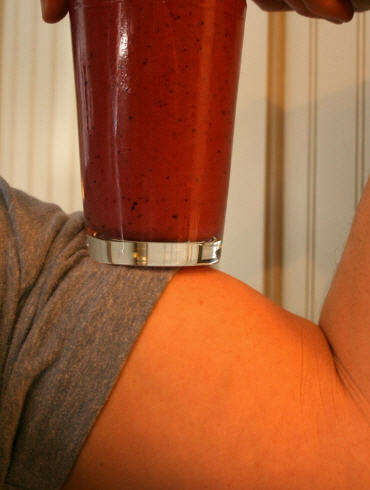 Start your blender on the lowest cycle and then work your way up until blended smooth. A little too thick for you? Add a little more non-fat milk. Protein – add powdered whey protein. Just be careful to get plain and not flavored. If so, you will be stuck making drinks that fall within that taste. You can also add soy milk – great source of protein and no lactose. What did I tell you? Easy. You can make those drinks at home. Mix and match – the flavors are endless. But just know with anything you eat, moderation is the key. Even these tasty, nutritional drinks have calories and drinking too many of them can be counter productive. The recipes above can make two 8 oz. glasses. This entry was posted on March 9, 2010 at 8:18 pm and is filed under Recipe, Tips. You can follow any responses to this entry through the RSS 2.0 feed. You can leave a response, or trackback from your own site. Yum! I could use one of those right now since I am apparently skipping lunch. I wonder how try would taste of you froze them at night and let them thaw in the fridge in time for lunch. And these would be great to sell at your granola stand! Thanks for the tip of not using ice so they won’t get runny — never before realized why some smoothies go bad in the fridge and others don’t. I so do not miss working out at 5:30 in the morning! 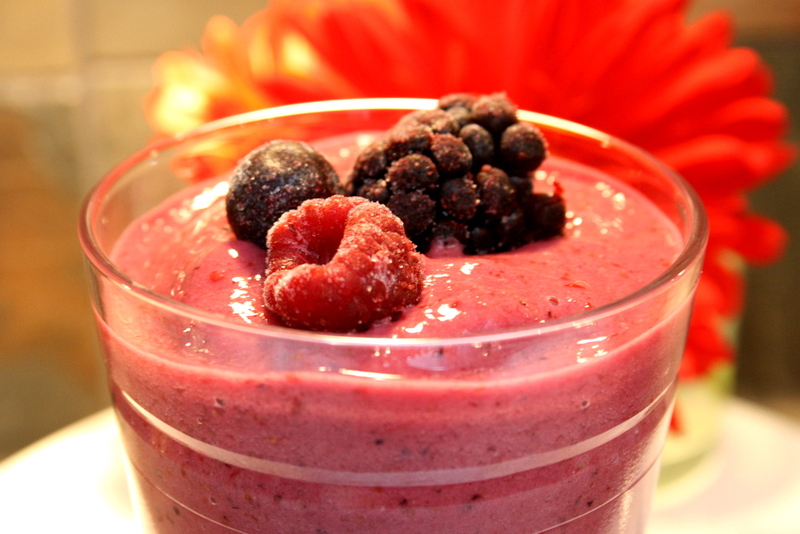 The Berry smoothie is the most delicious smoothie ever! I have one every morning now! Thanks so much for sharing the recipe! your post is simply spectacular and i can assume you’re an expert on this subject. Well with your permission let me to grab your feed to keep updated with forthcoming post. Thanks a million and please carry on the gratifying work.